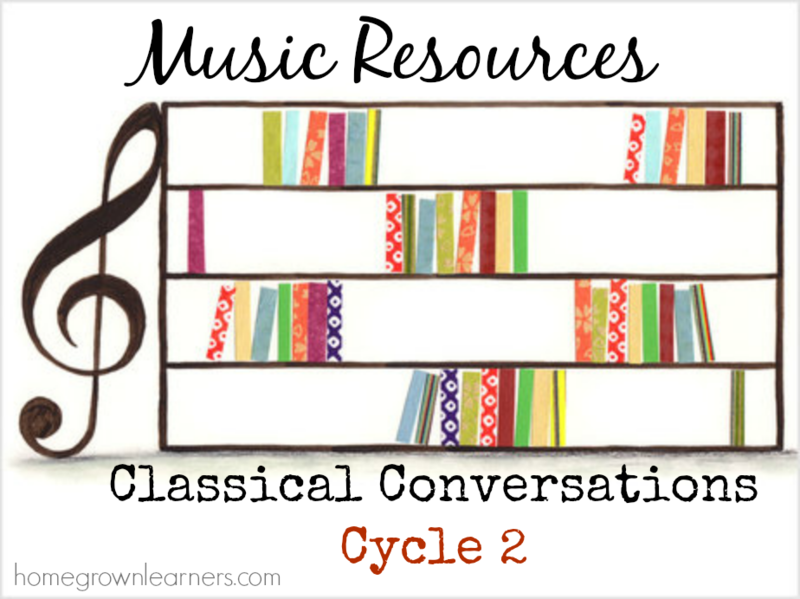 Music Resources for CC Cycle 2 - With a Bonus Giveaway! Last week our local CC community began our musical studies with a drama of Peter and The Wolf. It was so much fun! Learning about the instruments through this musical classic is the perfect way to kick off any child's study of great music. One thing I have learned through being involved with Classical Conversations is that less really is more. The material is of such a high quality, that if I find one or two good supplements to the memory work/art and music suggestions then we're good. This post won't be a huge list of music resources. Rather, it's just a few things we are using (and will use) to supplement the music portion of Cycle 2. Peter & The Wolf from Maestro Classics: This recording is extremely well done and gives children a look into the instruments as well as the life of Prokofiev, the composer. In addition to having a giveaway at the end of this post, Maestro Classics is running a $5 sale for the .mp3 download of Peter & The Wolf right now. That's a great deal! The sale is only good until March 24, so don't wait. The Young Person's Guide to the Orchestra: This piece, by Benjamin Britten, is one of the best ways to introduce your children to every single instrument of the orchestra. Listen to the piece online (Part 1 and Part 2), and then play some free online games to reinforce. We liked the game from Carnegie Hall and also this interactive website with all of the instruments while the piece is playing. SQUILT: If you are a member of CC Connected, you can find my SQUILT for Cycle 2 there. Look for user musicalmary and you can download a full listening guide and notebooking pages for each of the pieces suggested in the Foundations guide. For additional listening practice (or if you don't subscribe to CC Connected), my SQUILT Volume 2: Classical Era fits quite nicely with Cycle 2. In the SQUILT curriculum I teach children the GRAMMAR of music, and then they apply that knowledge through "Super Quiet UnInterrupted Listening" of great pieces of music. I happen to think it works really well with kids! Opal Wheeler composer biographies - these are just SO good. The one about Beethoven is one of our favorites and fits nicely with Cycle 2. Thomas Tapper composer biographies - these are a touch more simple, but very good for younger children. You can also find them for free at Project Gutenberg. The Story of the Orchestra - this book includes a CD and is a staple for any fine arts library for children. What are your plans for studying music during the last several weeks of Cycle 2? Does your tutor or community do anything fun and interesting with the fine arts component during this time? I'd love to hear about it!! Maestro Classics is giving one lucky reader a free download of Peter & The Wolf. Simply follow the Rafflecopter widget instructions below to enter. *This giveaway is open to ALL readers and ends Sunday, March 23 at midnight!